Kolkata, January 12: When a movie is released, you often have a critical opinion for it. But, at times this critical opinion turns into violent act of intolerance and the same was witnessed in Kolkata on Friday. 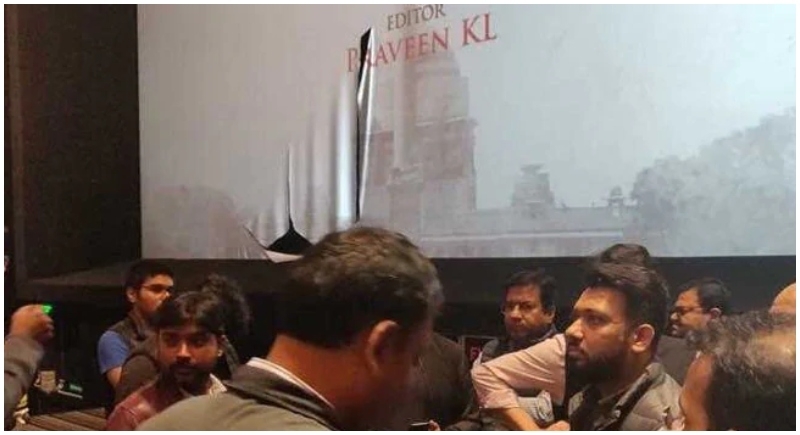 With the release of the much anticipated movie, ‘The Accidental Prime Minister’ hitting screens on Friday, the Congress hooligans literally entered and vandalised a movie theatre in Kolkata. Creating an act of intolerance, the congress workers protested against the release of the movie, “The Accidental Prime Minister”. The party workers had been up to civic disorder all day, first burning effigies of Prime Minister Narendra Modi at the Hind cinema at Kolkata's Chandni Chowk. Further in the evening, the workers barged into central Kolkata’s Quest mall, Congress' flags and chanting slogans calling for the movie to be shut down, with the Mall's security unable to put a stop to their entry. Stooping down low, they proceeded up to the INOX multiplex at the mall's higher floors during the 8:20 pm primetime show, entered the hall, went up to the screen and ripped it apart at the bottom. Despite the clear flaw in the screen, the Congress workers' designs didn't pan out as the audience continued to watch the film in this state and the multiplex refused to cancel the show in question or any other show of the film. The police also then intervened to bring the situation under control. On Friday, West Bengal Chief Minister's remarks can also hardly be considered mature. Speaking in Barasat, she said that the movie had been made "suddenly", adding, "What is the meaning? This is wrong. These people are doing drama over this film. If they are screening accidental PM then they should remember one must make another film 'Disastrous PM'". The Congress workers are trying to block the release of the film ever since the trailer has been released. Although there are many attempts lined up by the congress workers and WB Chief Minister’s did not make any difference to the people as they continue to watch the movie. The film is actually based on an inside account of the UPA-1 Dr Manmohan Singh PMO by his own media advisor Sanjaya Baru. Baru's book of the same name had released before the 2014 elections.